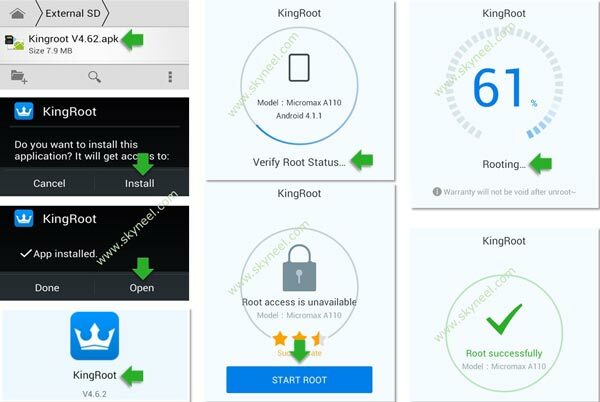 KingRoot Application is an application that allows you to root your Android Device, which is running on Android 2.2 Froyo to Android 6.1 Marshmallow. It is a powerful Application for all Android devices. What is a KingRoot Application ? KingRoot Application is an application to easily root your android devices in a tap. After root you can install unapproved apps, deleted unwanted System Apps, update the OS, replace the firmware, overclock the processor and customize anything. One Tap root: This Application allows to quick root access on your Android devices, running on Android 2.2 Froyo to Android 6.1 Marshmallow in a tap only and most important its works on unlock bootloader devices. If you want to root your device using KingRoot you must unlock bootloader first then try this Application. Purify App: This option allows to uninstall pre installed system apps, Mangae Auto start apps, clear cache and battery management. Its working when your devices is rooted through KingRoot. Must required Internet on your device: KingRoot Application requires you to have active internet connection. .
3. Your device must have active internet connection. 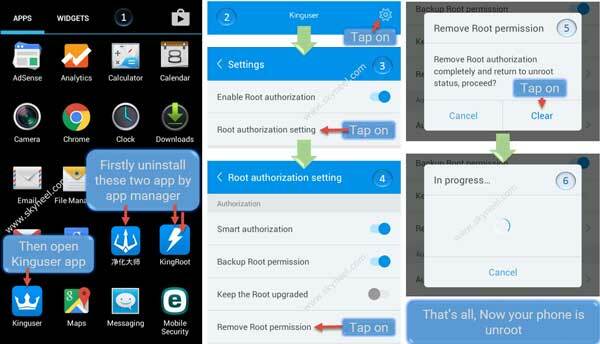 Step: First of all, uninstall KingRoot app and Purify Chinese language app(see in image 1). Now open Kinguser app then tap on right cone gear icon (setting button). You will see Root authorization setting, tap on it (see in image 4). Now find Remove Root permission option then tap on it (see in image 4). You will get a popup tab on your phone screen for removing root authorization, now tap on clear button then unroot process start now. That’s all, now your device is unrooted. I hope you like this KingRoot Application and root your phone easily. By the KingRoot App, you can use root level privilege and easily install or flash stock ROM, custom Rom and recovery on your Android device. If feel any problem in this guide then please use comment box. Credit and Thanks: KingRoot studio. Oppo f9, this app not install,Why? Hi Manoj, this app didn’t work on New version of Android now. My device is a Samsung Galaxy SM-T560. I installed KingRoot on it. But it do not want to root. Is it absolute necesssary to install Purify? Because Purify failed to install. It doesn’t matter if I enable or disable installing unknown devices on the Galaxy. And afterwards KingRoot seems to refuse the rooting proces. Will you inform me how I can go further? you need download a latest KingRoot APk and try again. I downloaded first version which is mentioned above but it didn’t work.. Now downloading last version, hope it will work.. Very thanks for providing this tool.